Hi, and welcome to psych_out! I've collected 50's, 60's, and early 70's records of almost every genre - Psych, Prog, Psychedelic Funk, Soul, Rhythm'n' Blues, Pop, Folk, Garage, Acid, Freakbeat, Rock, Jazz e. C and everything in between for all my life!!! Obviously, 90% of the LP's I've ever gotten hold of are completely trashed from the hard living ways and the rock'n' roll, drug and booze fuelled debauchery of all the wild parties of the times, but the golden 10%? Reluctantly, I've decided to offer them to all of you serious record collectors out there!!! Make no mistake, I'll try my best to consistently offer some of the. I aim to put a weekly batch up (time permitting) every Wednesday, all timed to end 10 days later on Saturday night. I'll only ever offer. VERY RAREST UK 1ST PRESS. I won't insult you with later 2nd pressings unless they are of exceptional quality and rarity. I'm sure you love good music as much as me, especially when it's a 1st Press LP, direct from the master tape, as the musicians intended it to be heard none of this "digitally remastered", weak reissued, remixed rubbish from hired hands with one eye on the mixing desk and the other on the clock! If these session men really knew how genius should sound, surely they would've been geniuses themselves? There will only ever be one Hendrix, and that's just a tiny example. Be sure to add me to your favourite sellers list and check my auctions frequently as i'll be listing some gems that you just. Want to miss out on!! T itle : Elvis Presley - Rock'N' Roll No. 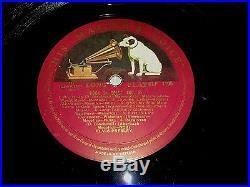 Label & year : Original HMV CLP 1105 LP , UK Mono 1957 INCREDIBLY RARE 1st Press!! Matrix's : Side A : G2-WP-7207-2N (1 A) , Side B : G2-WP-7208-1N (1 A) ONE OF THE FIRST 900 EVER PRESSED!! IMPOSSIBLY RARE SECOND LP FROM ROCK'N' ROLL'S ULTIMATE LEGEND!!! AND NOT ONLY THAT, THIS BRILLIANT EXAMPLE HASNT HAD TOO MUCH PLAY AT ALL AND SOUNDS FANTASTIC, HAS A TRULY AWESOME SLEEVE FOR ONCE, AND OUTRAGEOUSLY 1A 1A STAMPS!!! ON OFFER HERE IS THE VERY SECOND ELVIS LP RELEASED 59 YEARS AGO!!! TO SAY THAT THIS UK 1ST PRESS IS IMPOSSIBLY RARE WOULD BE AN UNDERSTATEMENT!!! TO FIND AN EXAMPLE OVER HALF A CENTURY LATER IN SUCH A GREAT CONDITION LIKE THIS IS. "Before Elvis, there was nothing" - John Lennon. About : Ultra Rare Original 1957 UK 1st Press!!! And therefore had a very small run, and is INCREDIBLY HARD TO FIND, especially in this condition!!! AN absolute classic LP from this incredible legend!!! An astonishing album that really DESERVES to be in EVERY serious 60's / 70's record collection!!! Don't miss out on this MEGA RARE LP!!! Classic UK 1st Press ridged HMV labels!!! Both sides are OUTSTANDING with NO real signs of age, NO graffiti, and NO writing OR tears whatsoever!!! Just has a small amount of ultra light spindle marks which suggests that this hasn't had too much play at all!!! FANTASTIC for a 59 year old record!!! Both must grade overall at least as Very Good++!! Spectacular Original UK 1st Press Vinyl!!! Nice bright, clean and shiny as if it was just pressed!!! Fantastic jet black mirror like surfaces, it looks GREAT for it's age with NO nasty deep scratches whatsoever, and NO deep groove-breaking vicious scuffs whatsoever!!! The only blemishes are just a few light scuff marks, a few light hairlines and age marks here and there, and just some of the usual light wispy sleeve traces (only visible in direct angled light) from general use and where it has sat or been removed from it's cover over the years!!! On a modern, thin LP, these marks would possibly hinder play, but because this is such an ultra thick quality 1st pressing, it plays fine with no trouble AT ALL!!! Used, but definitely AWESOME for a record of this age and rarity!!! Must grade overall at least as Good++!!! Graded STRICTLY to the UK RRPG standards, not overgraded AT ALL!!! Thankfully, it plays BRILLIANTLY with fantastic mono blast and clarity!!! It really sounds incredible with NO hisses, hops, skips OR sticks!!! Only like pretty much ALL records has just a mere touch of the lightest crackle here and there, only a few light ticks here and there on rare occasions and a touch of light frequency crackle on the First In Line vocal (truly minimal compared to most), and a hint of low level ultra light "bluesman's fag" atmospheric static here and there such as on some of the quieter sections like the run in grooves and between some tracks e. C, but it TRULY doesn't overshadow the music AT ALL!!! I'd even argue it gives it added soul!!! And that's truly about it!!! The vast, vast majority of the music is ultra clear and sounds AWESOME with that bass, depth, warmth and clarity you can only get from 1st Press UK vinyl!!! ASTONISHING for a record of this age and rarity!!! Must grade overall audibly at least as Very Good++!!! Graded STRICTLY to the UK RRPG standards, not trashed or overgraded AT ALL!!! 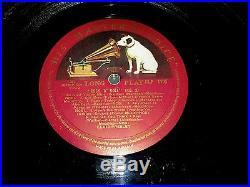 Original UK 1957 HMV fully laminated flipback sleeve complete with original inner!!! IMPOSSIBLE to find this sleeve in anything approaching a good condition - most are spent, torn and worn, covered with graffiti and with huge sections missing due to age and the lifestyles of the buyers of this particular LP!!! This one is NOT too bad at all and looks FANTASTIC, especially considering the nature of these fragile sleeves!!! NO excessively bad marks AT ALL, and still strong, solid and beautifully presentable after all these years!!! Only has a few usual signs of ageing such as a small amount of ultra light creases and a touch of a record imprint, only some very minor minimal ageing along parts of the opening such as just some very minor general ruffling and only a very tiny little piece missing to the bottom right corner of the front centre and just one tiny little tear just above the centre (truly fantastic for this sleeve), just a little wear to the centre of the spine and top seam (truly mild and not split through at all - NO daylight), only the very lightest hint of dulling to the white back (barely any at all - ASTONISHING for a six decade old sleeve), a touch of denting/rounding to the four corners which basically ALL vintage LP's have, and just to be sure!!! One or two other minor signs of age here and there, though nothing that really stands out to note at all!!! I tend to bring it down by listing every minor negative I can possibly find, but this really is a OUTSTANDING sleeve!!! The colours are as vibrant as ever, and a TRUE rarity to find one as complete, together and beautifully presentable as this - most have been virtually destroyed with huge sections missing, tears, pin holes e. C, but not this one!!! It remains strong, solid, unsplit, unspoilt and beautifully presentable, and even the spine remains strong, solid, unsplit and mostly readable too!!! Must grade overall at the least as Very Good+. Summary : A BRILLIANT example of this INCREDIBLY RARE classic original 1957 HMV debut Mono UK 1st Press LP with an utterly FANTASTIC sleeve!!! Hard to find in ANY condition, but SERIOUSLY RARE TO FIND ONE AS TRULY AWESOME AS THIS!!! YOU MAY NEVER GET THE CHANCE AGAIN, so don't miss out on this scarce opportunity to own a true piece of 60's/70's music history!!! Please take a look at all my other auctions for many other ultra rare classic LPs, and feel free to contact me with any questions you may have. Thanks again for looking, it's truly appreciated!! I've realized that most countries have their own unique grading system. I base mine strictly on the UK RRPG grading system occasionally with a + or a - to indicate the higher and lower ends of the grade, though I only use these if i'm having real trouble deciding! I will reluctantly accept cheques, although they will take at least a week to clear. That is why I prefer the other methods, as it means I can get your item to you faster. Please just ask if you have any questions or if you require further information. The photos below are of the genuine item, apologies for the occasional blurryness or glare from the light in some of them. If you would like further pictures or details, please ask. If you are not happy with your item, please let me know within 3 days. I pride myself on my 100% feedback so if there are any problems, I will do my very best to sort them out. All my auctions start from a bare minimum price, so there is always plenty of opportunity for a bargain! 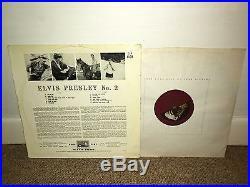 Please check my other auctions for many more of the rarest, most awesome Vinyl Record items ever!! _gsrx_vers_625 GS 6.9.7 (625). The item "ELVIS PRESLEY Rock'N' Roll No. 2 LP Mono 1957 HMV UK 1st" is in sale since Monday, October 17, 2016. 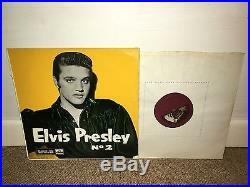 This item is in the category "Music\Records\Albums/ LPs\Rock\Elvis"." and is located in North Wales. This item can be shipped worldwide.